With news that Nintendo’s retro box the NES Classic has been outselling flashier current-generation video game consoles this summer, it’s clear that video game nostalgia is all the rage. If that love for old Nintendo games has hooked you as well, then you’re going to want to meet Athens group Bit Brigade. Adopting conventional rock instruments to meticulously rework classic 8-bit NES soundtracks, the group’s show is essentially a real-time soundtrack to a live speed run of a classic game, projected behind them. For their stop at Exit/In tonight, Aug. 10, the band will tackle none other than The Legend of Zelda (which you can hear them tackle here), with local kindred spirits The Mad Gear kicking things off, and artsy, garage pop group The Daytona Machines in between. This show definitely has a particular niche, but if it’s your niche, tickets are available right here! Read on for more about the show. Over the last maybe decade or so, video game music as a live performance medium has grown from incredibly niche to borderline mainstream (take, for instance, Nashville’s own beloved Mega Man inspired rockers Protomen, or ever-prevelant influences in electronic-infused artists like Grimes, or even video game themed symphonic tours of major classical venues). And, while many chip and glitch purists have found ways to use modded game systems, computers, and electronics to craft music entirely from retro tones, another whole subset of acts have carved out a style using more traditional rock instruments to reinterpret video game soundtracks and styles. Athens, Georgia’s Bit Brigade fall into the latter camp, but with an incredibly cool twist: the band, made up of some supremely talented shredders from other Athens area acts, meticulously work classic game soundtracks (almost entirely NES), which they put out as formal releases, but their real bread and butter is their live show, which involves expert retro gamer Noah McCarthy performing speed runs of games projected on a screen, while the band provide a live, dynamic, and perfectly-synced accompanying soundtrack. It’s an impressive, technical, and gloriously nerdy feat, and if you’re someone who enjoys watching retro speed runs (a whole cottage entertainment industry in of itself) and/or enjoy full-band reimagining of 8-bit tunes, Bit Brigade’s The Legend of Zelda show at Exit/In (presumably the first NES title, though their recently reworked and re-released Zelda LP contains music from several of the original games) is going to be an experience to remember. Local trio The Daytona Machines are nothing like Bit Brigade (not only does their band have nothing to do with video games, but sonically, they’re a leap as leap), but they’re still an awesome choice to support, and, honestly, sandwiched between two instrumental, video game-geared acts, they’ll serve as a nice palate cleanser. Since first springing up just a couple years ago, the band, whose sound is a stellar fusion of ’80s art punk and noisey, contemporary garage pop, have been popping up on more and more shows, fast becoming a fixture of the DIY scene, and their eponymous debut EP, released back in the spring, is one of our favorite under the radar local efforts of the year. Like Bit Brigade, Nashville’s The Mad Gear are a video game band who eschew the chip and glitch trend to craft music with more traditional instruments (even incorporating brass and woodwind into their impressive, eclectic sound). Though they have done covers, the group, even more impressively, have largely stuck to taking the retro game sound tradition and crafting original tunes from it, providing soundtracks to their own short film and free, online old school beat ’em up game. Essentially, if Bit Brigade caught your interest, you’ll love The Mad Gear too. Show up early! 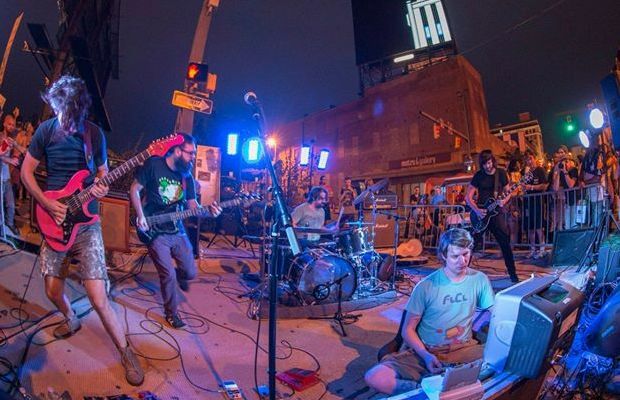 Bit Brigade, The Daytona Machines, and The Mad Gear will perform tonight, Aug. 10 at Exit/In. The show is 18+, begins at 8 p.m. (doors at 7 p.m.), and tickets are available to purchase for $15. Don’t Miss Earth w/ Holy Sons | TONIGHT at the Stone Fox!